The lack of fully automated generalisation forces National Mapping Agencies to maintain topographical data sets at different map scales. For consistency between map scales, but also for supporting (future) automated generalisation processes, information on similarities and differences of the separate data sets should be identified and formalised. This includes information on valid data content at the different scales (‘scale state’), but as important is the semantics of multi-scale and generalisation aspects (‘scale event’). As ‘scale state’ and ‘scale event’ are strongly related (‘different sides of the same coin’) it is important to integrate these in a single model. 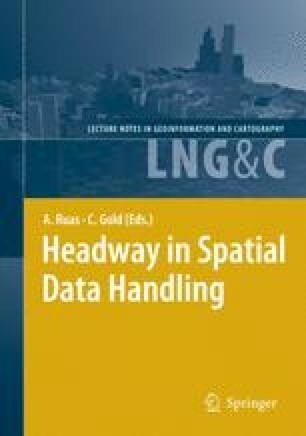 This paper presents a semantically-rich data model for an integrated topographical database, facilitating (semi-)automated generalisation. UML (including OCL) is used to formalise the model. The scope of the model is outlined and the model is presented based on an analysis of several alternatives for modelling multi-scale and generalisation aspects. The model is evaluated by instantiating the model and applying it to test data.